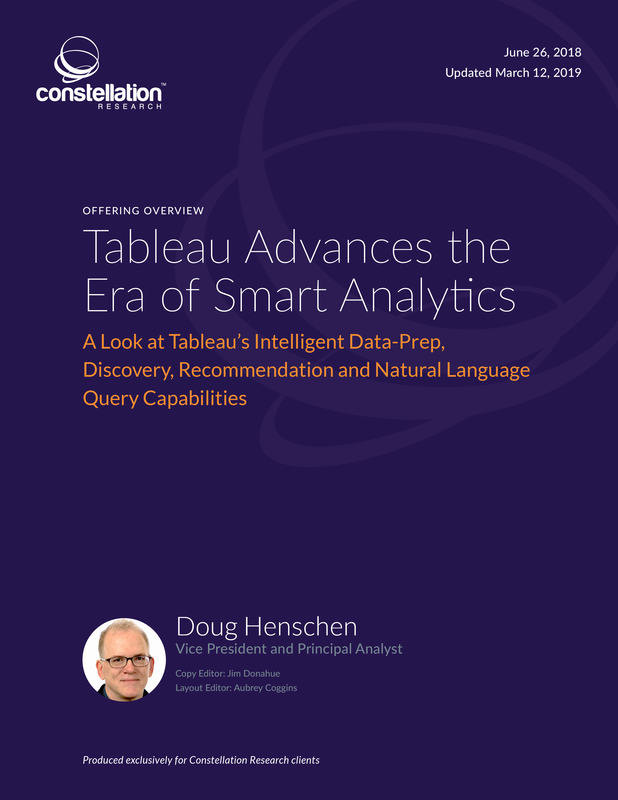 Tableau Advances the Era of Smart Analytics | Constellation Research Inc. The next breakthroughs in business intelligence (BI) and analytics will see machine learning and artificial intelligence used to improve data access and data quality, uncover previously hidden insights, suggest analyses, deliver predictive analytics and suggest actions. What’s more, natural language (NL) interfaces will make it easier for business users without knowledge of data science or query languages to explore information, gain insights and make better, data-driven decisions. BI and analytics vendors are developing “smart” capabilities in at least four areas: data prep, data analysis and discovery, NL query, and prediction. Smart features will power the next step beyond self-service analytics, helping to further democratize data analysis for business users. This report explores the smart features that Tableau Software has introduced and is investing in and how these capabilities will benefit Tableau customers. The report concludes with recommendations for organizations seeking to implement smart analytics capabilities. This report was originally published in June 2018 and was updated in March 2019.